Ray Stubblebine has spent more than 20 years studying the 221 home designs Gustav Stickley published in his magazine, The Craftsman, from 1904 to 1916. This book, which draws on his own research and travels, is the long-anticipated result. It will join several others—including Gustav Stickley: The Craftsman (1983, reprinted 1993) by Mary Ann Smith; Gustav Stickley’s Craftsman Farms: The Quest for an Arts and Crafts Utopia (2001) by Mark Alan Hewitt; and Gustav Stickley (2003) by David Cathers—as essential reading for anyone seriously interested in Stickley and in the American Arts and Crafts movement he came to personify. Stickley began his career in the furniture business in the late 1880s and began his first “experiments” in Arts and Crafts furniture in 1898. He began publishing The Craftsman as an adjunct to the business in 1901. The idea of integrating architecture into the business and publishing his own home designs appears to have emerged and crystallized around 1903, after Stickley had published several articles on residential architecture by noted architects. In the first 100-odd pages of the book, Stubblebine traces the origins and evolution of the Craftsman Home idea and the design and building of Stickley’s own family homes. Over the next 400 pages, he covers each of the Craftsman Home designs, beginning with “No. 1 (Series of 1904, No. 1) January 1904” and ending with “a very simple bungalow cottage,” published in December 1916, shortly before Stickley’s business collapsed into bankruptcy. “A goal of this book,” he writes, “is to make all of Stickley’s known designs available in one place for the first time.” Although two books of Stickley’s house plans have been made widely available, they contain fewer than half of the homes that were published. Moreover, Stubblebine’s research suggests that Stickley’s shop may have designed more—perhaps many more—homes that were done as individual client commissions. As his research and that of others continues, the present book marks a milestone in Stickley studies that is likely to be an essential guide. Big as it is, this new book is not the last word on houses built according to the published plans of Gustav Stickley. And that’s just what the author intends. Undoubtedly, other owners and architectural sleuths now will recognize Craftsman Homes out there in the world, and will add them to the record. Ray Stubblebine, himself an owner of a New Jersey house built according to Plan No. 104 (1910), for decades has been on the lookout for previously undocumented houses. His archival research, which began in amateur curiosity, became more scholarly over the years, until he found himself the expert on Craftsman houses. The result of his long search is this oversize book with more than 500 pages and a nearly two-inch spine. It shows all 221 designs from the years 1904 through 1916, reproducing original floor plans and renderings. Historic photos of some of the houses are included, along with commissions and special designs. Then, most provocatively, contemporary photos show the houses Ray has found, as they look today. The word “Craftsman” has long been used as a style designation—somewhat synonymous with “American Arts and Crafts.” This book makes it clear that there is a more accurate meaning, too: that a Craftsman house is one built according to plans published in The Craftsman magazine. Designs run the gamut from log cabin to bungalow and chalet to Prairie Suburban and even row house. The houses are attractive and workmanlike; some are quite beautiful, and a few are, well, ugly. Still, seeing them all complied creates an impression of Stickley’s vision. They have in common a vernacular appeal, a kind of homeyness that is genuine. That Gustav Stickley’s Craftsman Workshops made Mission Oak furniture is general knowledge. But not so many know that, beginning in 1904, Stickley (and hired pens) designed homes and offered blueprints that readers could order. The word “Craftsman” is seen as synonymous with a style. But a true Craftsman house is one built according to plans published by Gustav Stickley. Anything else is more accurately called Craftsman-style or, better yet, Arts and Crafts. In his magazine The Craftsman and in book-size compilations, Stickley showed plans and renderings with advice on appropriate colors, textiles, and furniture (from his workshops, of course). The houses were embraced by the top of the planbook market; their cost to build was above average and customizing was prevalent. Some lovingly rendered motifs—hand-wrought copper hoods and extensive built-ins, for example—never made it into construction, for reasons of taste or budget. Craftsman Homes are diverse; fewer than half could be called Bungalows. As you can see from the mere handful of designs here (out of 221 different plans), they run from Rustic Bungalow through Tudor Revival, Saltbox, Mission, Chalet, and Ranch styles, with a sprinkling of urban brick row houses and gambrel colonials. Nevertheless, Craftsman Homes have a look we can learn to recognize: often broad and low with exposed structure, naturalistic, related to the site. Soffits are deep, with exposed rafters if not the Bungalow’s stylized brackets. They are homey without being nostalgic. Exterior interest is provided not by ornamentation but by materials and by the shadow lines of pergolas, recessed porches, and balconies. Except in woodsy locations, wood doesn’t necessarily predominate. Stone, cement, adobe, and tile are common, and brick appears where the material has local precedent. No one has ventured a guess on how many Stickley houses were built, but we do know they exist around the country, and “from Alaska to Fiji.” In his new book, longtime sleuth and Craftsman Home-owner Ray Stubblebine documents the published plans and shows us houses he’s tracked down, in their original or not-so-original states. (The book is reviewed on page 24.) Stubblebine points out that the designs were not avant-garde but “democratic,” meant for the middle class, whether they looked like pioneer cabins or houses for suburban lots. A few are awkward, even ugly. Most, however, are undeniably appealing. Ray Stubblebine’s new volume, a lifetime’s magnum opus, provides an exhaustive review of the homes promoted by Gustav Stickley over the years of publication of his The Craftsman magazine. Published from 1901 to 1915, The Craftsman was a vital component of the first American Arts and Crafts movement, promoting its spirit, theory, and style in a fashion that was far more democratic — far more accessible, and relevant, to ordinary citizens — than its English counterpart. While Gustav Stickley will ever be associated with furniture, especially given the auction prices his best pieces fetch, and the high profile of the family brand in recent years, he was also a tireless promoter of arts and crafts sensibility as an approach to building, so much so that his Craftsman nomenclature has become associated with a particular architectural style — the rustic, woody, slope roofed, shingled and porched medium size homes that are so much a treasured part, coast to coast, of the American build tradition. While The Craftsman magazine offered plans and commentary on an eclectic range of vernacular styles, many quite un-bungalow, un-Craftsman-like in outward appearance, his interiors were distinctly arts and crafts, with their paneling and art lamps and cozy fireplaces. Stubblebine’s great achievement is providing, in one hefty volume, a complete catalog of house designs published in The Craftsman, along with a description of each, floor plans, and photographs, both historical and contemporary. In his nineteen years of Stickley investigation, Stubblebine located examples of a good portion of the homes, presenting them chronologically from 1904 to 1916 — some 220 separate designs. Introductory chapters introduce the Craftsman “idea,” provide wonderful photos and detail on the homes Stickley designed for himself and his family, and discuss arts and crafts colors, the missing element, of course, in the mainly black and white magazine layouts of the era. Stubblebine also addresses the question of Stickley’s contribution to the design of the homes presented in his magazine. Not an architect, the author suggests that “design director” would be an appropriate description, as Stickley set the tone and critiqued the work of the many architects who worked for his magazine over the years. The particular contribution of Harvey Ellis in the early years of the magazine is highlighted. "Ray Stubblebine, a New Jersey-based journalist who lives in a landmarked Stickley house, has set out “to make all of Stickley’s known designs available in one place for the first time.” With lavish illustrations, he summarizes Stickley’s biography and then analyzes each of the 221 house plans published in The Craftsman. Stubblebine has studied suggested cladding, floor plans, interior finishes, and even curtains. He’s also found realized examples, demonstrating how closely builders followed the magazine’s captivating spreads." "There are a number of beautiful books on Stickley and his followers. The best is probably Stickley’s Craftsman Homes, by Ray Stubblebine…"
"Invaluable Reference," October 13, 2008, by Walter O. Koenig "Amoxtli"
If you are interested in the work of Gustav Stickley, then this book is for you. This invaluable reference begins with a short biography on Stickley and then gives a comprehensive introduction into the Craftsman Home idea. This included not only home designs, but extensive interior decoration, accessories and furniture. The book then goes on to describe chronologically each of the 221 homes which were designed by Stickley and his staff between 1904 to 1916 and published in the Craftsman Magazine. For almost all designs the original floor plans are given as well as original photos or drawings and photos of what the houses look like now. The descriptions are very concise as the author Ray Stubblebine is a scholar and expert in the field. He is also the photographer of this lavishly illustrated book. The book is well bound and the illustrations and photos are well printed. The bibliography contains many helpful sources. This book is a veritable Stickley encyclopedia and would make a fine addition to any collection of architecture books. It can also serve as a reference in identifying Stickley houses and furniture as well as serve as an aid for home restorers. Definitely a five star book. This book is a dream if you love Stickley's homes. This book has all of Stickley's plans, and I found it a fascinating read. I really loved dreaming while reading, and the pictures and info were wonderful. Wow ! Just received this and it is fat and heavy and loaded with incredible photos, plan reproductions, copied stuff from The Craftsman magazine ... If you are into Stickley, and especially into the houses he designed and published, then this is your destination. Expensive but worth it. Nice job everyone, and a big thanks to Gibbs Smith, who continue to show their support for the Arts and Crafts movement and architecture and building in general by publishing a slew of great books. Enjoy ! August 22, 2009, by Craftsman Fanatic "Bob"
Fabulous book and/or coffee table piece for those lovers of Stickley architecture and craftsman design. Very comprehensive, historically astute and beautifully produced. While aficionados of the Arts and Crafts movement are certainly familiar with Gustav Stickley's furniture, fewer are aware that Stickley also designed more than 200 homes, many of which were built throughout the United States. In "Stickley's Craftsman Homes" (Gibbs Smith, $75), Ray Stubblebine collects, for the first time, all known house designs featured in Stickley's nationally circulated magazine, The Craftsman, in publication more than 15 years. Why should Northwesterners care? Because Stickley-designed homes are virtually in our backyards. Stickley had a huge following and a very large subscriber base. Those who couldn't afford the subscription could borrow the monthly magazine from local public libraries. The ease with which Stickley made plans available to people anywhere in the country is evidenced in a house built on the ridge above Frink Park in Seattle's Leschi neighborhood. The plans for house No. 78, published in the November 1909 issue of the magazine, were ordered by Mrs. Henry E. Holmes and shipped to her from New York on Aug. 28, 1910, purportedly as a wedding gift to her daughter, Ruth, on the occasion of her marriage to attorney Richard Huntoon. Pharmacist Holmes and his wife, Kate, lived in a commodious Victorian residence, and his family of four daughters and a son settled in houses on the property. 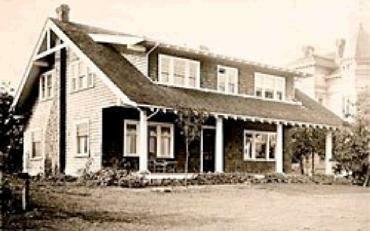 The Stickley bungalow had a broad, covered porch facing Lake Washington. The completed house was somewhat different from the design, perhaps because Stickley gave them something special or because the builders did. Stickley-designed houses also appeared in Spokane, Portland and Astoria, among other places. For example, in 1910 Lewis and Harriet Gilliland commissioned architect Ellis Lawrence to help them modify a 1907 design from The Craftsman to suit their property in Portland's Irvington neighborhood. The "H" plan home featured an ashlar foundation and trellised entrance court framed by two similar gabled wings. The gable roof design differed from the hipped roof suggested in the original plans. The interiors closely followed Stickley's suggestions for built-ins, a stone fireplace and fireplaces in two first-floor bedrooms. However, they were more lavishly handled than Stickley might have done, with a Honduran mahogany-paneled living room and dining room and a leather frieze. Advertisements for The Craftsman ran in Northwest periodicals. But people had no need to go to Gustav Stickley for building plans and interior-design ideas. Jud Yoho, an enterprising Seattle businessman, published Bungalow Magazine from 1912 until 1918. During its run, the magazine attracted a nationwide audience of homebuyers, advertised the products of businesses and showed off the newest construction of bungalows in Washington, Oregon and California, as well as in the rest of the country. The monthly supplement included plans for a featured bungalow. Bungalow Magazine had nearly twice the circulation of The Craftsman, if one believes the 1915 statistics in the Ayer & Sons' American Newspaper Annual and Directory. It reported circulation of 40,000 for Bungalow Magazine and 22,500 for The Craftsman. Yoho's success caught the attention of Stickley, who, in 1913, began proceedings to sue for use of the word "Craftsman" in marketing bungalows. In his book, Stubblebine shares the deposition interviews to provide insight into the two entrepreneurs' fight. In the end, Yoho acquiesced, agreeing not to use the word again. But that was, in his mind, not a binding agreement. His 1914 Bungalow Magazine continued to use the word "Craftsman" to advertise the plans of his Bungalow Company and his memorable 1916 deluxe catalog sported the word proudly on the cover. Larry Kreisman is program director of Historic Seattle and author of "Made To Last: Historic Preservation in Seattle and King County." The Huntoon house, commissioned by Henry Holmes and his wife, Kate, is pictured in about 1914, shortly after it was completed on a ridge overlooking Lake Washington.